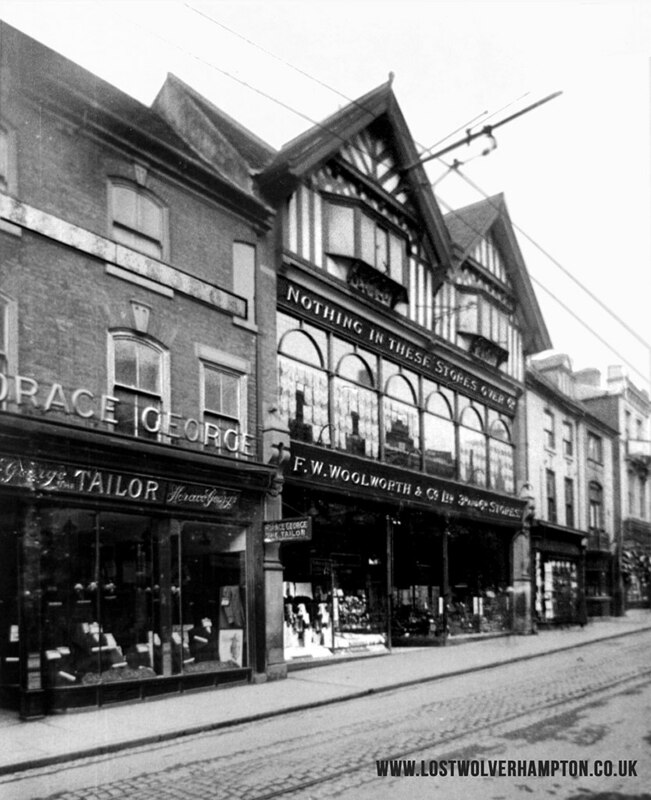 Store 31 was the first ever Irish store, opening in Grafton Street, Dublin, on 23rd April 1914. 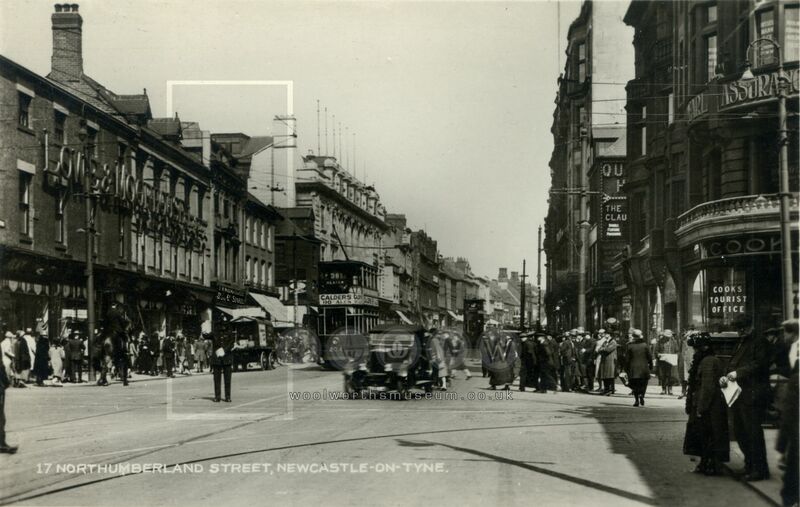 It was on a corner site in fine Edwardian red brick buildings, seen on the left of this postcard. Opening in Ireland had its obstacles. The IRA formed in 1919 to bring about independence, there was violence and antipathy against any retailer selling non-Irish products and there were boycotting campaigns. Woolworths became increasingly reliant on Irish suppliers to fill their counters here. This is a photo from the store’s 25th anniversary in 1939. In the 1960s it still had it’s unique look, but soon after it was replaced by the standard house style, with all three Edwardian buildings sadly being demolished. 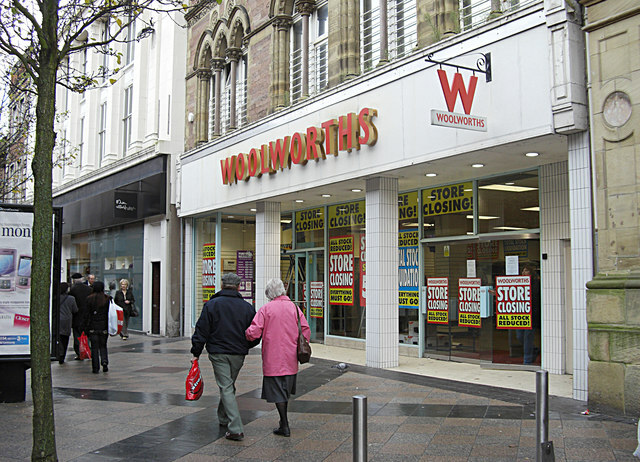 The store closed in 1984 when Woolworths decided to leave Ireland. The building was split in two – one half was HMV, the other half Next. Today the building shared by Massimo Dutti and Boss – you can see the 60s architecture with it’s triangular windows when you look up. And if you look next door at Monsoon, you can see how the original Edwardian building would have looked. If you are looking for Store 30, Edgware Road, it has already been written about – you can read all about that store here. 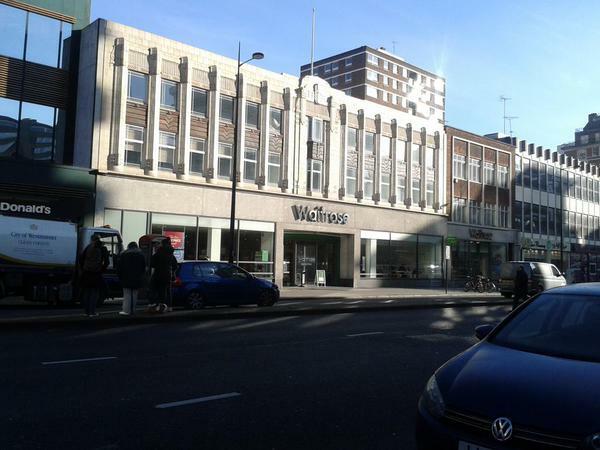 Woolworths opened on Edgware Road on 21st March 1914, the 30th store to be opened in the UK. The store was extended in 1936 to quite a large size, which was when an Art Deco facade was added. Source: Woolworths 100 Years on the High Street, Morrison K.
In June 1986 it was one of the first ‘Operation Focus’ comparison stores, where a peppermint blue colour scheme was rolled out. Possibly this was when they extended into the shop next door on the right. As it was the closest store to Head Office, it often had trials taking place here. In 2000 it became a Woolworths General Store, being one of the early pilots for this scheme, and was re-numbered to 2031. 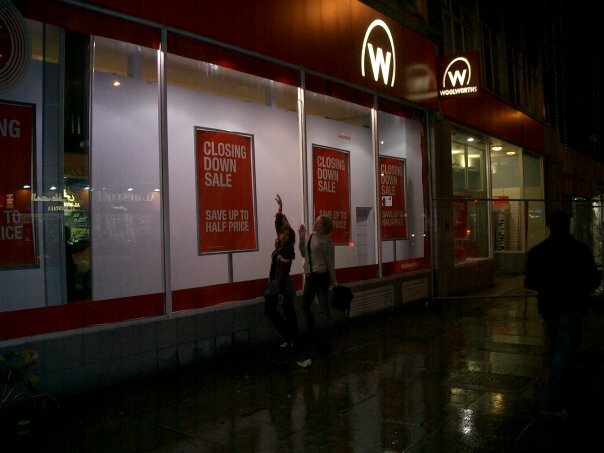 Somewhere between 2007 and 2008, the powers that be decided to change the fascia back to the traditional red Woolworths one – a bit late as it stopped being a General Store long before 2008. Then they decided to close the store anyway! This was in July 2008 when 4 London stores were chosen to stop trading, before the whole chain went bust at the end of the year. Here’s a picture I took just before it closed down. The store traded here until 1975 when it moved into the Eagle Centre (now intu Derby, previously Westfield). It is rather a shame to see how the building looks today, divided up with ugly storefronts. It should be a beautiful building, but this side of Victoria Street is neglected due to all the shops being inside intu Derby. Nevertheless, if you pop into Savers, do take a look up at the original architecture. In 1975, a huge Woolworths superstore with two floors was built inside the new Eagle Shopping Centre. There was a super modern cafe inside (well, modern for the 70s) – carpets and plush leatherette seating, with a warm orange-brown colour scheme, boldly patterned walls, individual lamps hanging over each table – it’s sounds like the retro styling that is back on trend now. The store closed on 16th January 1988 when Woolworths decided it was too big – they planned to sub-divided the store into 10 units and lease out, with Woolworths Properties acting as landlord. I think the store was next to C&A, which closed down in 2001. It was boarded up for a while until Woolworths decided to come back to this Derby shopping centre as store 1242 (1 London Road) – but then it closed down in 2008. It is now Poundland – so I’m guessing the original Eagle Centre Woolworths unit would have been near that Poundland somewhere. The next store – Store 30 – Edgware Road has already been written about, you can read all about that store here. The twenty-eighth Woolworths store was in Darlington. It opened on Northgate in 1913 with Frank W Woolworth personally opening it. The store was extended in 1927, and this is possibly when an Art Deco facade was added. 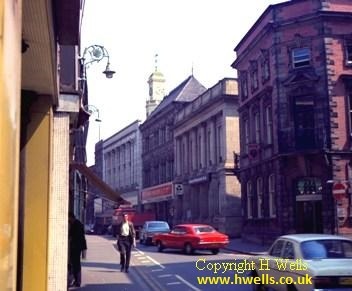 Graham Soult did a lot of research to find out what the building is today, as it seems the street numbering changes across the decades – you can read more about that here. He worked out by looking at the location of building in old postcards, that the Woolworths store would have been next to BHS at 56-58, formerly Burtons, then a £5 store and now vacant. On 20th September 1940, the store relocated to bigger premises at numbers 12-18, joining togther three shops by the looks of it. In the below photo, you can actually see the old store front further down the road. 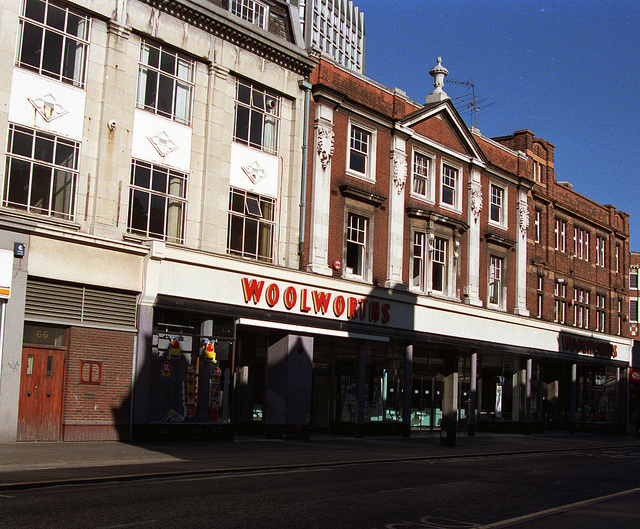 Now this old Woolworths is occupied by Next and the smaller side to the left is occupied by Holland and Barratt (not pictured here). 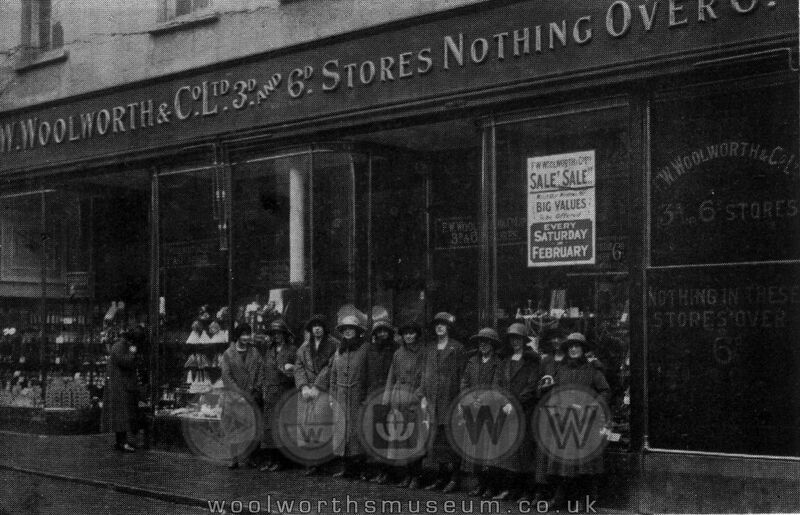 The twenty-seventh Woolworths store opened on 6th September 1913 at 17 Northumberland Street, next to the first Fenwicks department store. Every picture from the early years shows a Carter Paterson’s lorry or container – they brought up goods from the railway station to replenish the counters. The store was so successful that it trebled in size by 1936. The elegant, enlarged building was put up around the existing store so shopping could continue while works went on. The style was Art Deco with windows in trios. The building stayed relatively unchanged through the decades. A new fascia was put on in the 1980s, but the store closed shortly after, when Woolworths disposed of city centre stores to save on costs. This store closed in 1984 and was pre-let to Next. But Virgin Megastores actually took on the site, which changed to Zavvi in 2007. Then it was a Peacocks store. and today it is Sports Direct. And despite all these shop changes, it is lovely to see the Art Deco architecture still intact, and looking bright and clean! Next time you are in Newcastle-Upon-Tyne, do have a look up above Sports Direct. There is no information on when the store closed. 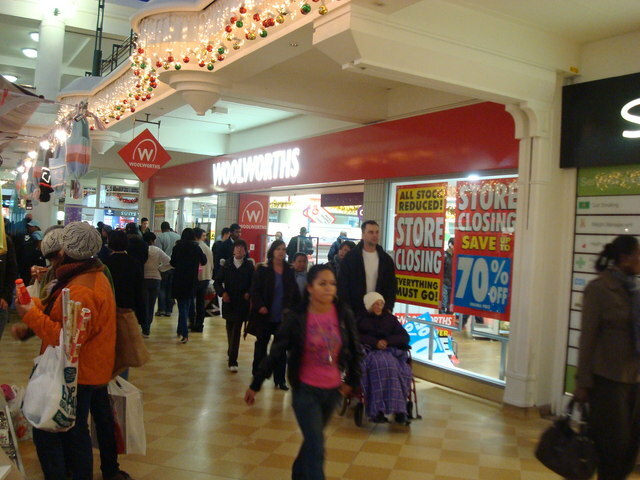 We do know that a new Woolworths opened in The Mall shopping centre – Store 1240 – which closed when Woolworths collapsed. The building of Store 26 in more recent years was a Dorothy Perkins, which closed in 2016, and a bit of the frontage went to Sainsbury’s. The inside of Sainsbury’s is actually the old Woolworths – so it was quite a big store. The front of this building does look very 60s/70s, I would assume this happened when they did the big side extension in 1973/4. The Dorothy Perkins side became a Peacocks store. But now the store is vacant. Again. 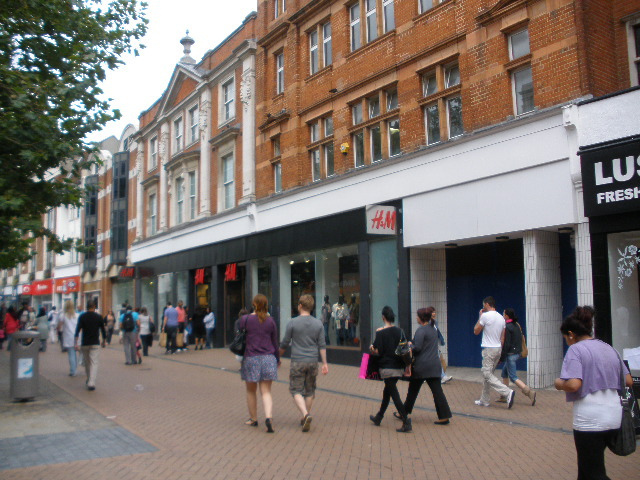 The twenty-fourth Woolworths store opened on East Street in Southampton in 1913. East Street was a very historic shopping street, it actually has an ancient history going back to medieval times. 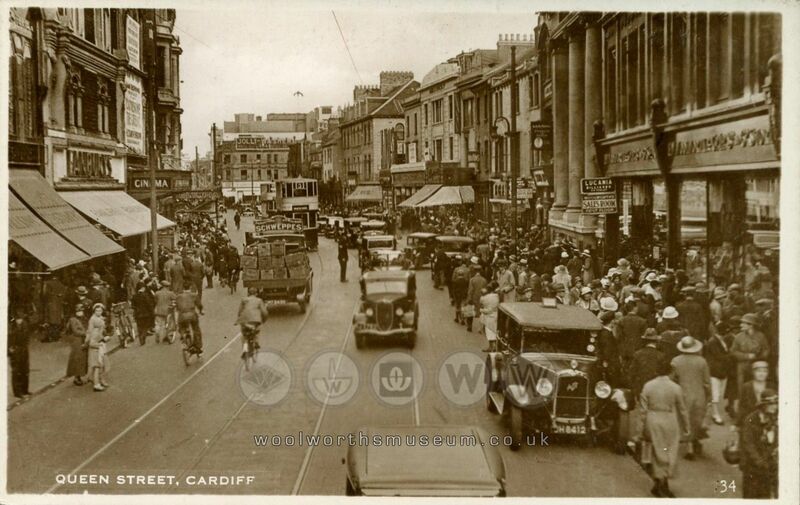 It was a very popular area, often crowded with shoppers, which is why it was a good location for Woolworths. It was located directly opposite a huge department store called Edwin Jones which Debenhams bought in 1928. 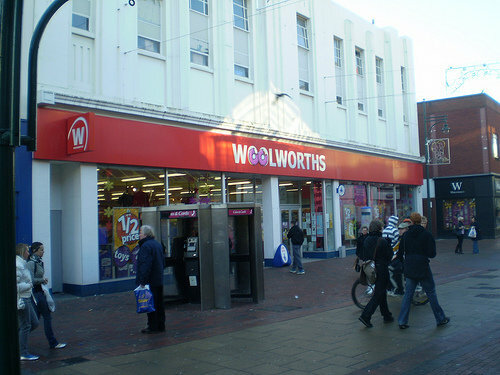 Woolworths in East Street must have done well as just 10 years later, another larger branch of the store was opened in nearby Above Bar Street – Store 128. Both stores stayed opened alongside each other. The premises in East Street were bombed in World War II and new premises which took 5 years to build were erected and opened in 1959. There are no photos of the store, and nothing written about the closing date. But if it follows the pattern of other towns that had two Woolworths stores, it probably closed in the early 70s when the Above Bar branch store would have converted to self-service. Today the building is occupied by Snip, which is variant of Costcutter the convenience store. You can see how large a store it is, on a corner plot. 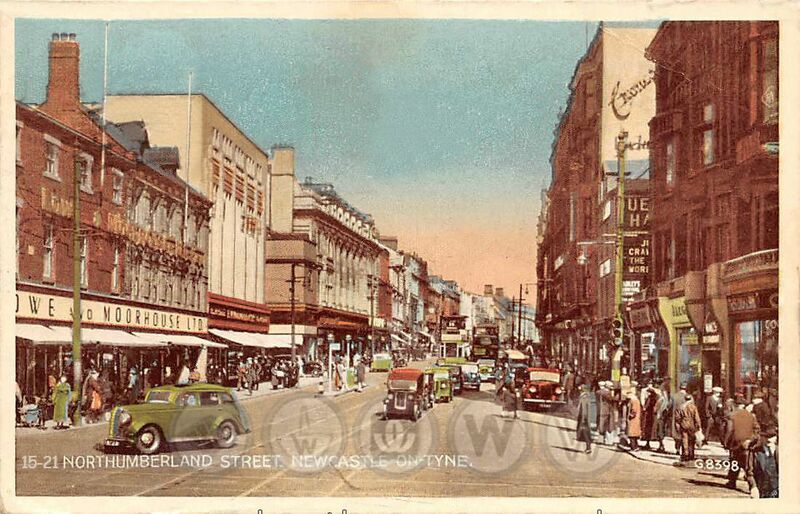 In 1963 Woolworths moved to Lower George Street, but again there are no photos of the exterior. There was a refreshments bar inside. It closed along with five other stores in the country on 29th January 1983. Today a new development has been built on that site that includes Whole Foods Supermarket. 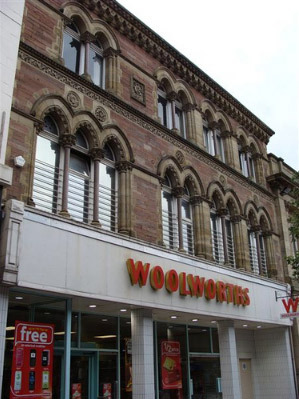 Woolworths opened its twenty-second store in Warrington in rather ornate building in 1913. The Grade II Listed building was designed by the Chester architect John Douglas and was one of his earliest works. It was constructed in 1864 as the showrooms for the furniture makers Robert Garnett and Sons, whose factory was directly behind the shop. There was an upstairs floor, a cafe and a rear entrance. It had rear stairs that were closed off in the late 1980s. Some more recent photos here – you can see the peppermint blue window and door frames. After the store closed, a supermarket called Asco took it’s place, but it did not last long. It went bust after 6 months. 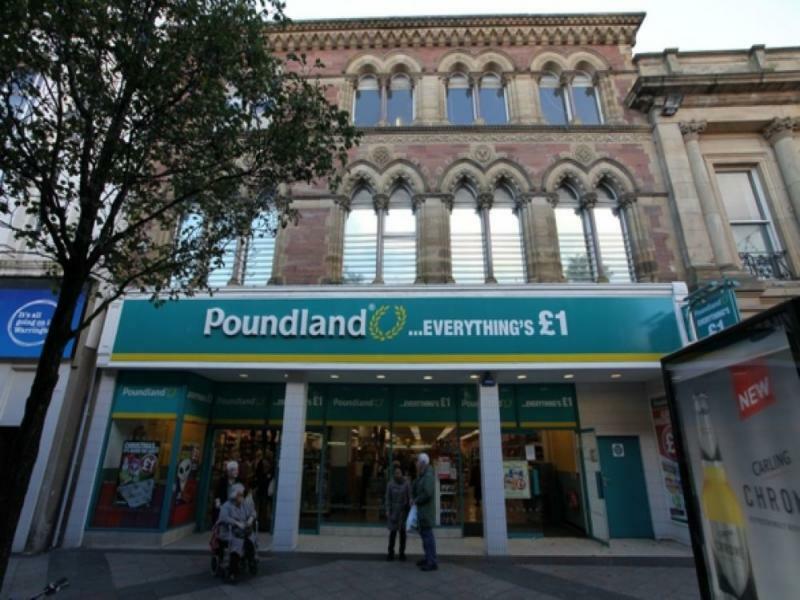 Today the building is occupied by Poundland, and you can still see the ornate architecture above, and the familiar Woolworths mosaic tiling on the pillars. 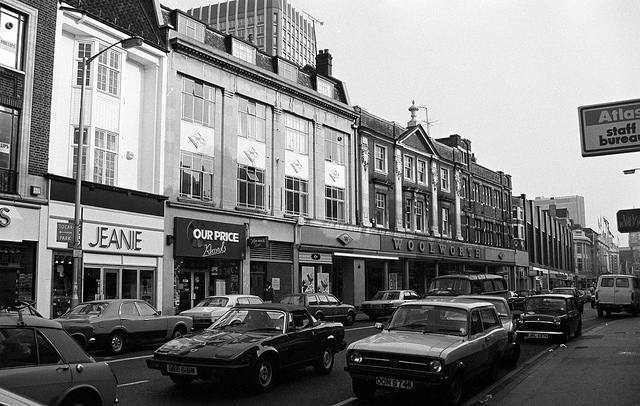 The twenty-first Woolworths store opened in Wimbledon in South West London. Originally numbered 30 The Broadway, it was later renumbered 65. You can see the store to the right of this photo. 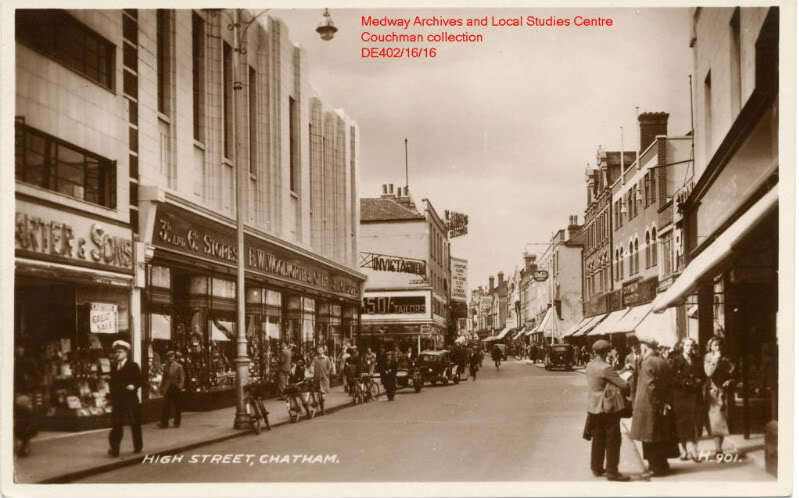 When Mackies the drapers closed in 1936, the store was extended to the corner of Gladstone Road. 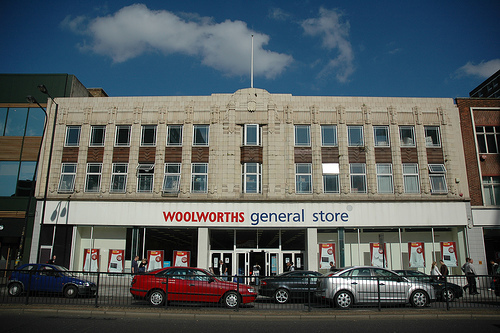 It was one of very few stores designed by Woolworths with exposed brickwork in a moderne style (styles of architecture popular from 1925 through to the 1940s). Somehow, Woolworths of Wimbledon survived the bombings of World War 2 intact despite direct hits on other buildings nearby in both The Broadway itself and Gladstone Road. After the fire, the store had to be rebuilt and did not reopen until 1982. The replacement was clad in red brick with vertical window panels and an attic floor disguised as a roof. The store closed for good at the end of December 2008. Today the building is occupied by TK Maxx. 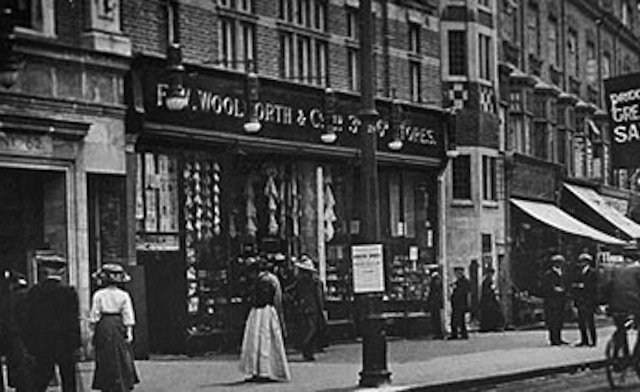 Woolworths opened its twentieth store in Lewisham, South East London in 1913. I am guessing this is because of its location near a railway station. Below you can see how it first looked before it had a rebuild. Source: Woolworth’s 100 years on the high street, Morrison K.
In 1937 the store was upgraded with a cinema front. The company was particularly proud of its galleried frontage. The neon lettering at the top of the building cost £50,000! 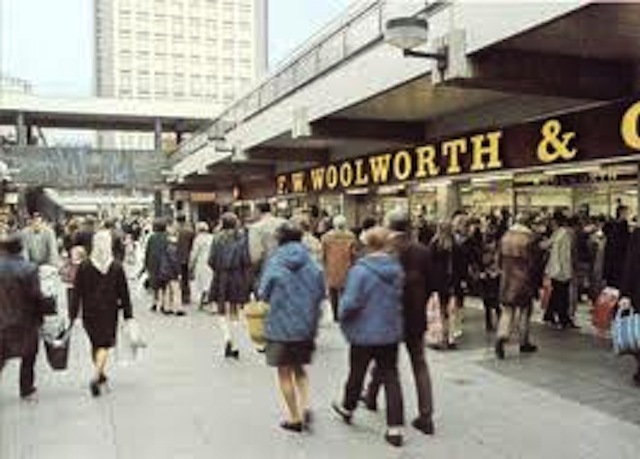 When Lewisham Shopping Centre opened behind the Woolworths store in 1975, Woolworths made another entrance at the back to the shopping centre. In the 80s, the store was halved in size and that is when Superdrug moved in. Then in the 90s, the store was split again and they kept the shopping centre side, which had a new store number, until closure in 2008. Today the building is shared by Superdrug and Currys, and somehow just does not look so grand anymore. Doesn’t it look huge in the old photos?? Maybe it’s the angle of the 1930s photo that makes it look bigger than it actually is. 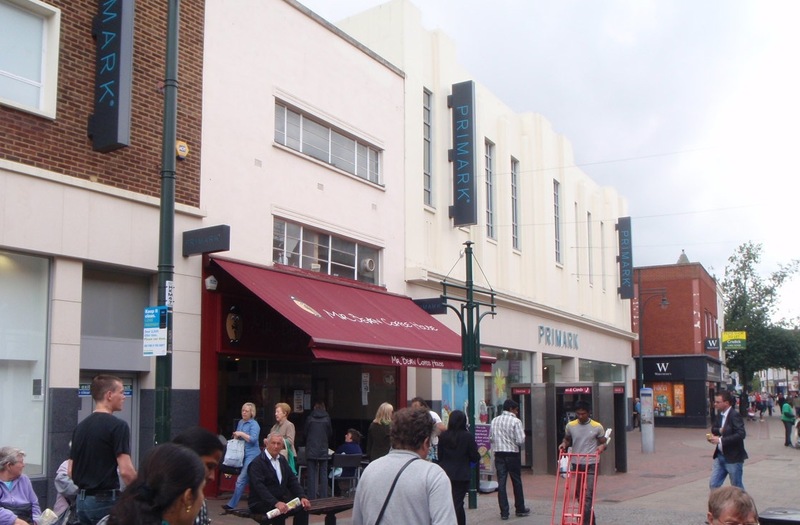 Still, it is great that the Art Deco front is still here – if you ever are on Lewisham High Street, do have a look out for it. 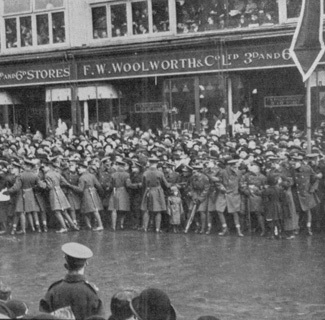 The nineteenth Woolworths opened in Ilford in 1912, in a prime location next to the town hall. There are no photos of it when it first opened. In 1938, the store was updated to have a simple Art Deco look. You can see it in the below photo – the large white building at the back. Here is a close-up photo from the 1970s. The store closed 29th January 1983, along with four other Woolworths stores across the country that day. 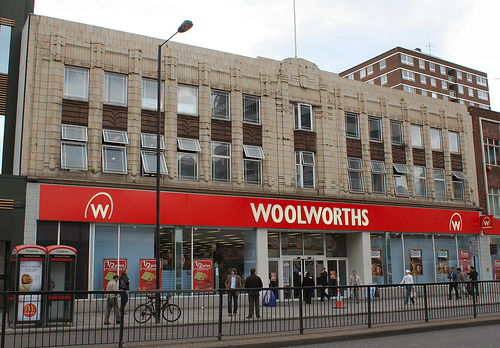 Today the building is occupied by Superdrug, Dorothy Perkin and Burton – so if you are visiting these shops on Ilford High Road, look up and see the Art Deco splendour of Woolworths past. The eighteenth store to open in the UK, Grimsby opened in 1913, completing a line of stores from the northwest to the northeast coasts. It originally opened on Cleethorpe Road. Grimsby store was popular with fishermen and docksmen, selling more hunting knives and budget breakfasts than any other branch. This is an image from a postcard being sold of eBay. There is no date but it looks very early on. 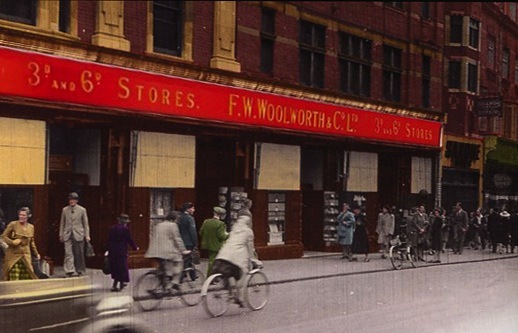 13 years later, Woolworths relocated to Freeman Street in a 4,174 sq ft store in April 1925. 9000 customers walked through the door in the first day and a half. In 1964 the store was ‘reskinned’. Located near the docks, this store was overshadowed by a new town centre store on Victoria Street which had opened in September 1957. This store closed in 1971, when the newer store had converted to self-service. Many towns with two Woolworths lost one in the 1970s. 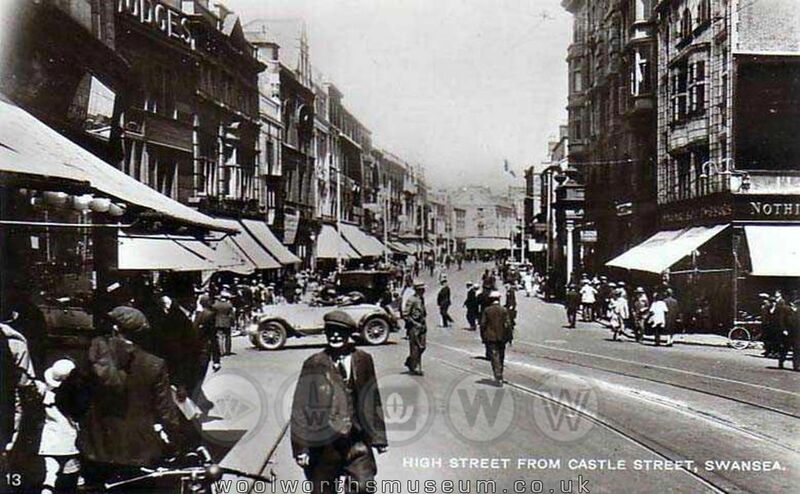 The FIRST Welsh store to join the chain, this store opened in 1912 on Castle Street. The store was so successful that they bought out the neighbouring Hotel Cameron premises in 1927 and moved there in 1928. The original premises vanished in a junction improvement scheme. The building was demolished down to the first floor after being bombed in the Blitz. It was then used up to the first store, without the use of the old upper floor offices which had proved difficult to sub-let in the Great Depression anyway. Here is how it looked in 1949. The Cafeteria signage was the same, but the 3d and 6d lettering was dropped. 1n 1958-59, the store was rebuilt in a 60s style, as you can see in the photo below, opening on 16th November 1959. This is the building that Swansea locals will recognise as Argos today. On 28th June 1986 the store closed as part of cost-cutting back in the 1980s, and sold to Argos. Understandable as there was another Woolworths store just 5 minutes walk away from this site. Here is it as Argos today. 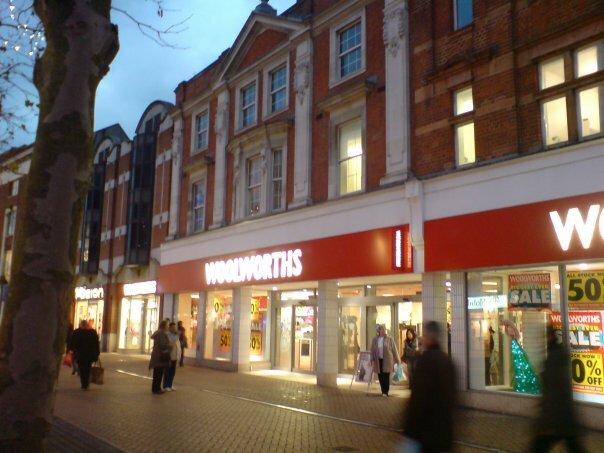 The thirteenth UK store, Woolworths first opened in Wolverhampton on Victoria Street in June 1912, taking over an ornate tudor-style building that used to be occupied by John Cavitt & Sons. Proud of their prices, they had an eye-catching ‘Nothing in the store over 6d’ sign along the top of the windows. By this time huge Venetian-style glazing had become a company favourite, flooding the upper floor with light, offering shoppers commanding views of the displays from out in the street. The store became known affectionately by locals as ‘Little Woolies’ from the late 1920s onwards, as a second larger store had opened in Dudley Street (Store 186). In the 1930s, Woolworths had got rid of the tudor-style facade (a shame I think!) and built the below building (on the left). They traded here as ‘Little Woolies’ until the 1960s. 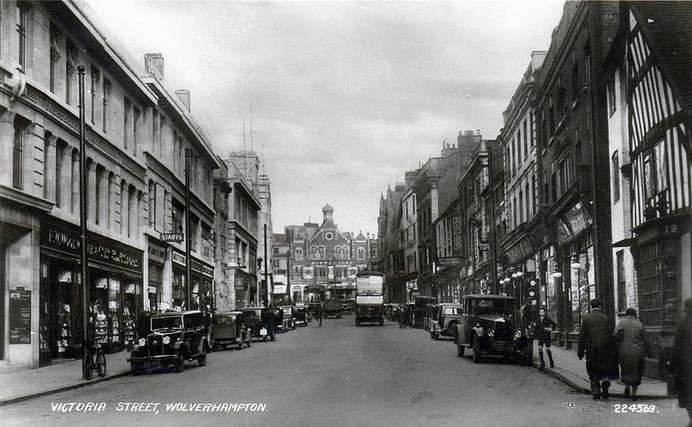 With the new superstore Woolworths in the Mander Centre, they was no need for a second store in Wolverhampton. From the 1970s, Barretts of Feckenham traded from here, they were a store selling outdoor and camping goods. 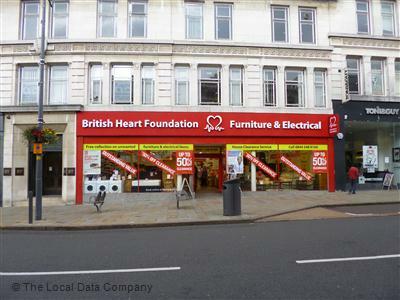 Today the British Heart Foundation Furniture & Electrical shop is at 58-60 Victoria Street. 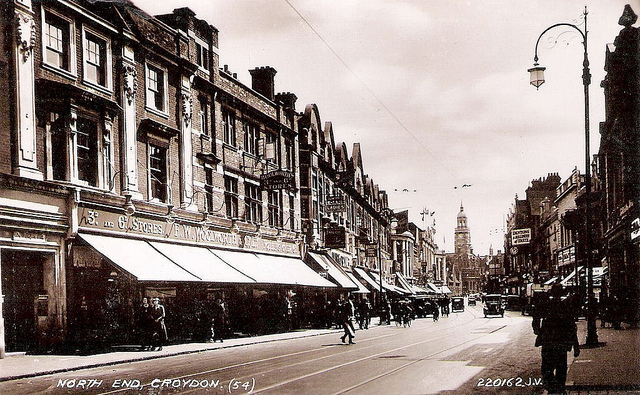 The Croydon store was the 12th Woolworths store to open in the UK and the 4th London store. It was opened by Frank Woolworth himself on 4th May 1912 on North End, right at the heart of the town. He had visited and shortlisted Croydon earlier, noting that the South East London location was “fine, progressive and bustling”. 1n 1929, Woolworths tooks over the cinema building next door and extended to a larger store. The final photo from December 2008, shared to my Facebook group just before it closed for good. Today the building is occupied by H&M, but you can clearly recognise the building from the architecture above. Quite a historic building.